Today is Teacher Prep Day, and even though I technically had the “day off,” my eyes have been bugging out of my head since 5:15 this morning trying to get all my grading done before the deadline early tomorrow morning. I have literally spent over 20 hours this “long” weekend grading, and now that I FINALLY finished with everything, I want to guzzle a gallon of Diet Dr. Pepper and watch about a billion movies and not interact with anyone or anything for the next 7 days or so (or at the very last, the next 7 hours). Whether it’s reading about food or cooking food or eating food, I am ALL about food. So it makes total sense that I would be totally obsessed with movies on food, right? Naturally, you should only plan on watching this particular movie marathon set with ample amounts of sweets, cream-filled delicacies, and large amounts of good carbs. Fair warning. Chocolat – a beautiful love story between a chocolatier and a wanderer, but the movie is about much more than the romance–this is a story about how piousness doesn’t have to mean shunning people or foregoing things (like food!) that bring joy. No Reservations – although the movie starts with a depressing beginning (girl loses her mother in a tragic car accident and goes to live with her aunt, a world-renowned chef), the movie is about finding the balance between work and home, between pleasure and duty. Penelope – the slightly bizarre story of a girl “cursed” (literally) with a pig face (also literal), who can only break the curse by finding true love. Surprisingly endearing for such a weird story, and it doesn’t end as obviously as one would think from the get-go. Waitress – although the movie has darker undertones (woman in an abusive relationship seeks comfort through inventing pies, but then finds out she unexpectedly got pregnant with a baby she didn’t want), the quirky humor keeps this one from feeling *too* depressing. 500 Days of Summer – a chick flick without the expected happy ending, this is the story of what many relationships really look like for at least one of the people after the break-up–some really good moments you keep playing over and over again, with a final reckoning of what really went wrong–and what it means for his/her life now. Stranger than Fiction – while this has a more conventionally happy ending, the premise is certainly a bit bizarre: an IRS auditor finds himself the protagonist in a book being currently written and unexpectedly starts to hear the author in his head, narrating his life as he goes. A surprisingly witty movie, with enough fodder in there to keep any English major laughing their guts out. Bandits – a woman allows herself to be taken hostage by two bank robbers who have been dubbed by the media as being “the sleepover bandits.” Trying to get away from a lackluster love life, she ends up falling in love with both the criminals. Don’t let the crime premise throw you off–this one is comedy and unconventional rom-com, through and through. While unconventional can be fun and unexpected and all, sometimes you just need a straightforward chick flick that you know will end happily, lives up to all the Hollywood stereotypes about love and romance, and will make you laugh a bit, too. These movies aren’t unusual or totally original, but they ARE perfect for when you need a feel-good rom com, and stat. How to Lose a Guy in 10 Days – a magazine writer decides to do a piece on what “really” chases men away by finding a guy and pulling all the “classic” what-not-to-do moves. Trouble is, the guy she found is in a bet of his own that he can get any girl to fall in love with him. Hilarity ensues. Lucky Seven – a lawyer (who lost her mother at a young age) is stubbornly trying to live the life her mom plotted out for her on a “timeline” before she died, right up to the detail that the seventh man she dated would be “The One.” Trouble is, she decides to use the local coffeeshop worker to try and make the numbers crunch, and he turns out to be more than what she expected. The Proposal – a hard-nosed Canadian editor is told she is getting deported out of the U.S. due to a visa issue, and she bribes her male secretary to pretend like they’re engaged to try and prevent it from happening. The newly engaged couple travels to Alaska to break the news to his family, and both parties discover that there might be more to the relationship than meets the eye. Win a Date with Tad Hamilton – a small-town girl enters a lottery in order to win a date with the most popular young movie star of the day, who ends up wanting to pursue it further. Trouble is, she’s already got somebody close to home who’s silently been crazy about her for years. Runaway Bride – one of the great classic chick flicks (in my opinion), this is the story of a reporter who gets fired after getting the facts wrong on a woman who always runs right before she reaches the altar. Reporter goes to the small town where she lives to redeem himself by getting the real story and ends up a lot more entangled in her current engagement than he planned to be. Father of the Bride – a story of (what else?) the father of a bride about to get hitched and all his conflicted feelings about the matter. Endearing and hilarious, this is a heartwarming wedding classic. My Big Fat Greek Wedding – a Greek girl finally manages to convince her strict father to let her go take courses at the local college, where she meets and gets engaged to a non-Greek (a definite no-no). An off-kilter comedy about weddings where two cultures collide. Bride Wars – a catty girl drama at its best (or worst), this is the story of two best friends who both accidentally planned their weddings for the same day at the same venue and shamelessly try to coerce the other into switching the day. Miss Congeniality – Combining a frump-to-knockout makeover with a possible homicide threat at the Miss USA pageant? A rom-com premise that could only be pulled off by the reigning queen of chick flicks, Sandra Bullock. John Tucker Must Die – a high school star athlete plays four girls from different cliques at the same time, and when they find out about it, they decide to get him back by having a new girl break HIS heart. One of my top five favorite guilty pleasure movies (right up there with She’s the Man). The Princess Diaries – another Anne Hathaway makeover, but this movie (as a whole) is a lot fluffier and teeny-bopper than Prada. Still a fun show to pop in, especially at the end of a movie marathon (where you’re just looking to zone out anyway). Clueless – This 90’s comedy is about a good-natured but oblivious high schooler who has taken on the new girl at school as her new “project.” In addition to giving her a truly horrendous makeover (courtesy of the trendy fashions of the decade), she tries to set her up with boy after boy after boy, all of whom are hopelessly wrong in every way. If you’re familiar with the Austen classic (Emma), this spin-off is surprisingly close to the original story. You’ve Got Mail – Another movie off of my top chick flicks of all time list, this one is a bit of a departure from the true Pride and Prejudice storyline, but the same premise is still there–boy and girl meet, they both despise each other from the beginning, but then things take a definite turn for the romantic near the end when they finally wise up. Austenland – While this pick doesn’t actually follow any of Austen’s stories (with the possible exception of Pride and Prejudice, slightly), it does poke fun at Austen fanatics (like me) who sometimes dream of what it would be like to live in the Regency era. Hilarious and odd, this is one of the few chick flicks to have come out in recent years that I actually cared for. 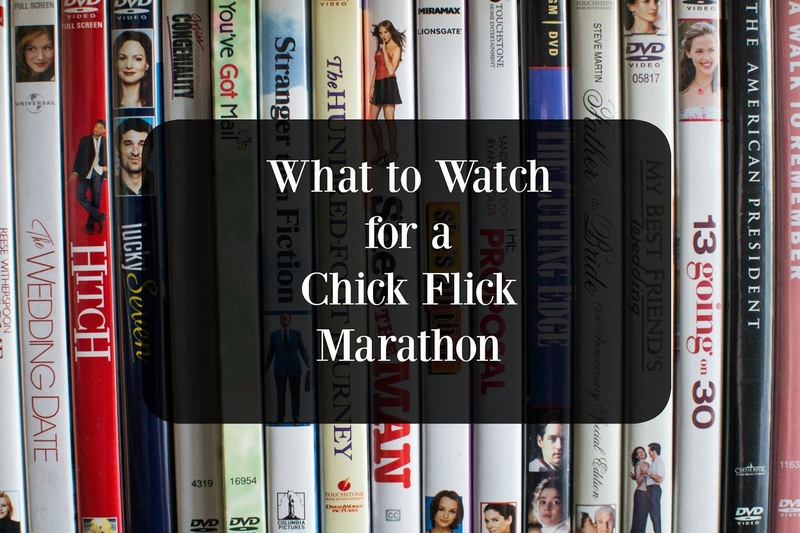 What chick flicks would you recommend for a movie marathon?